Genea-Musings: Amanuensis Monday - 1761 Probate Papers for Jabez Snow (1696-1760) Estate in Eastham, Mass. 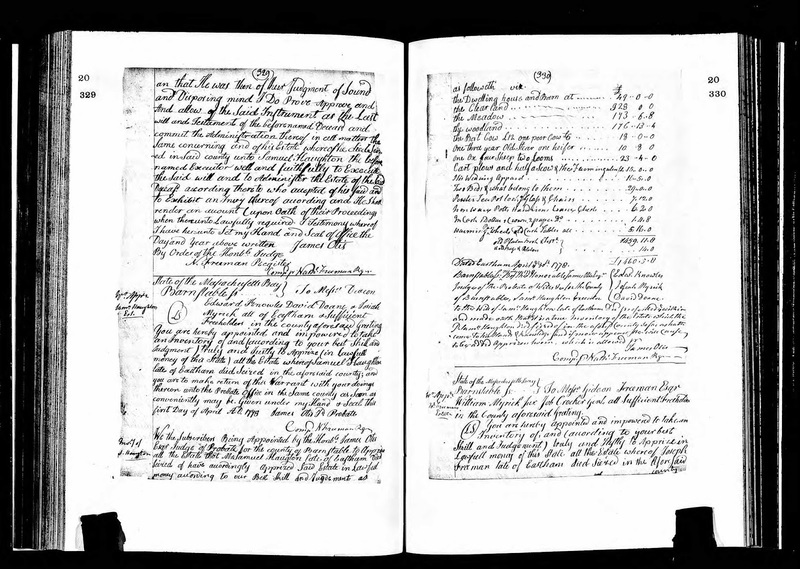 Amanuensis Monday - 1761 Probate Papers for Jabez Snow (1696-1760) Estate in Eastham, Mass. further Accompt to be Rendered thereof. 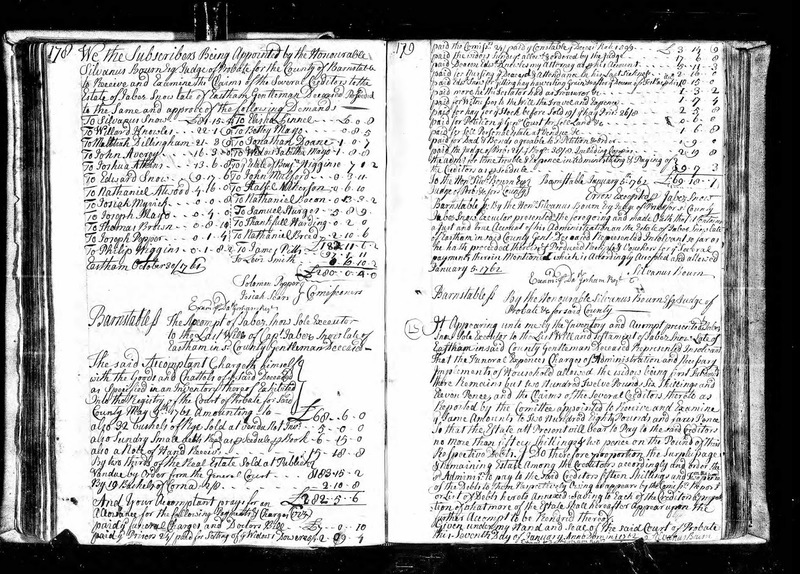 The probate records in this post were available on Ancestry.com but were not indexed. 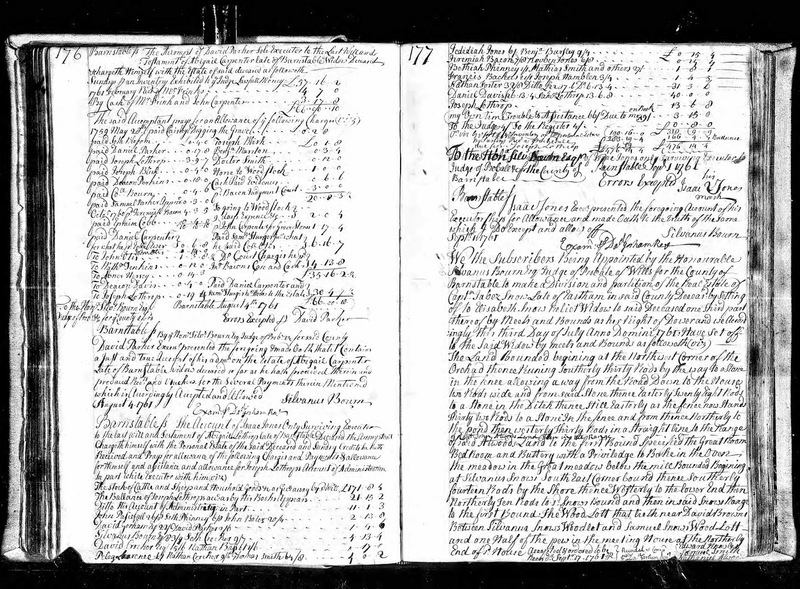 I recently checked the Probate Index for Barnstable County and found these records that explain a lot more of what happened to the estate. In the Dower document, the widow's one third portion of the real estate was set off by the committee. In the Insolvency Report, the commissioners listed the debts owed by Jabez Snow to his creditors, totaling £282 0s 4d.. In the Account, the executor listed the income collected (£282 5s 6d), including the real estate sold at auction. He also listed the charges, fees and other expenses incurred during his administration (£69 18s 1d). The remaining estate was thus £212 6s 11d payable to the creditors. In the Dividend, the Probate Court Judge ordered that the creditors be paid 15 shillings and 2 pence on the pound (about 75% of that owed) from the remaining estate. There is one more set of papers for this estate file. When the wife of Jabez Snow died in 1772, her one-third of the real property had to be sold at auction and the creditors paid up to what they were owed. I will transcribe those papers next week.